Banh Mi is a Vietnamese term for all kinds of bread. 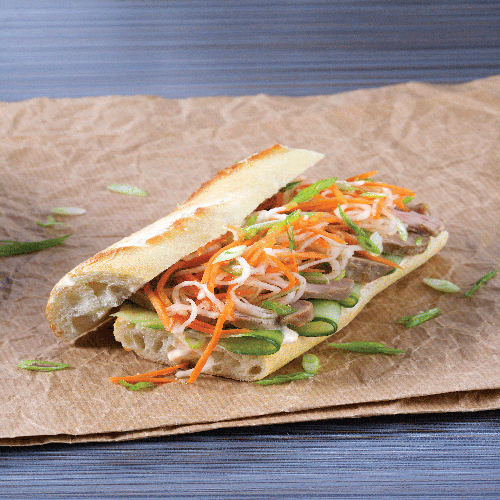 The bread is hollowed out and filled with a light mayonnaise mixture, a carrot daikon slaw and tender pork tenderloin. 1. Preheat oven to 400 F. Line baking sheet with foil and spray with vegetable oil. 2. In a bowl combine honey, vinegar, soy sauce, sesame oil and 1 ½ tsp Sriracha. Divide in half and pour half over pork. Roast for about 15 – 20 minutes just until pork is medium cooked, about 140 – 145 F.
3. Meanwhile add carrot, daikon and green onions to bowl with remaining vinegar marinade. 5. In a small bowl, combine yogurt, mayonnaise and remaining Sriracha. Spread over top baguette slices. With a vegetable peeler, slice cucumber lengthwise into 8 ribbons. Divide over sauce. 6. Slice pork thinly and layer over cucumber. Add slaw and chopped cilantro and top with other half of baguette.